One more writing service based in Australia. It does not differ a lot from all the others as it gives the same set of guarantees and has similar apps for iOS and Android as others do. The overall impression of the company is positive as they give a lot of information about what they do and how they do it. Be prepared to filling out a long order form to find out the price, though. Assignmenthelps.com.au claims to be a leader in article writing services. But it does not mean you can’t order a research paper here. No matter what kind of a writing problem you might be experiencing, you will find the support of experienced writers. the company has been functioning since 2014 and have positive reviews. Here you will find assessment help, research and report writing assistance, business plan and case study tips. The experts have relevant specializations and technical experience to support you. the guarantees include the standard list of common points like on-time delivery and plagiarism-free papers. The company also offers the lowest price guarantee. Your personal information will not be disclosed to avoid any possible misunderstandings. It is your right to ask for multiple revisions in case you are not completely happy with the delivered paper. You can get a 30% discount on the first order. To find out how much a paper you order will cost you, you need to fill out a special form on the website. A writer you will get to work with requires having as much information as possible regarding the order. The more details you specify the better. These details have a major impact on forming the final price. It is a bit inconvenient as you might be disappointed to see a pretty high price after spending a lot of time filling out that form. 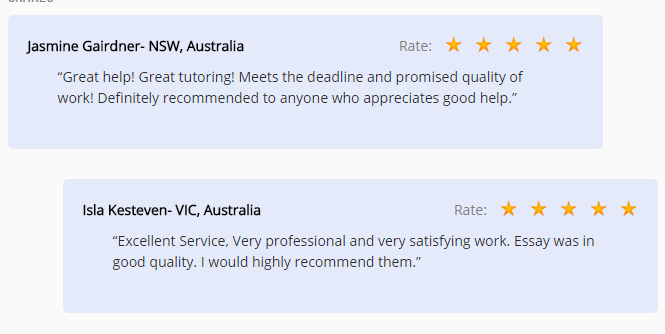 The testimonials you can find on the website show that students trust Assignmenthelps.com.au. Some of them use this service regularly. There are no grammar errors or types we’ve noticed in the content on every page of the website. It is a good sign that demonstrates accuracy and responsibility of the company. There is a possibility to contact a support team via phone or live chat. It might be a fast and easy way of getting an answer to your question. For instance, you might ask how much one page of a paper you want to order will cost you. There is no guarantee you will get a specific answer but you may try. They also have a WhatsApp number if you find it more convenient to use your phone. There is an app you can download to order papers online. Assignment Help app is available on iTunes and Google Play. It had a pretty high rating of 4.8 out of 5 which is good. You can really take the advantage of ordering an original paper from your phone. You can do it anywhere without having to wait until you get to use a laptop or PC.